DALLAS, TX-July 29th, 2017. DJARABI KITABS published four children's books by Author Shoohada Khanom. There are Little Blue Skater Boy, Imagine, Kamillah the Butterfly, and Who Could I be? . Little Blue Skater Boy : When Isa is asked to take biriyani to his Nanni's house, someone decides to jump out at him and then tag along. A re-telling of 'Little Red Riding Hood' with many twists. Imagine : It's bedtime! Yunus wants to talk but his sister Saarah goes on a imagining spree. She talks about animals, and dinosaurs and aliens as friends. She talks about sending an Eid gift to orphans and cooking extra meals in Ramadan for the poor, and a whole lot more! A fun, creative story, that also shows a loving sibling relationship. Who Could I Be? Through the book, children will learn about animals and their distinctive features, and the repetitive use of questioning encourages them to use the clues to keep guessing and wanting to turn the page to find out what animal it is. Most importantly, it sheds light on and promotes the beauty of our Creator’s creations. Kamillah the Butterfly : Kamillah is a caterpillar who is struggling to understand life’s changes. With a friend by her side and discovering a beautiful surprise at the end of her cycle, she happily accepts the biggest change. A lovely book any child can relate too. It will definitely leave little ones wanting to read it repeatedly. When asked what motivated her to write these creative children's stories, Khanom said, "When I had my first child, I started investing in a home library. That's when I realised there was a lack of books for Muslim children that are fun and engaging. I then had an idea for a story and almost dreamed about how great it would be if there was good, quality picture books for Muslims that looked and read like the mainstream books." Join DJARABI KITABS PUBLISHING on Facebook @djarabikpub for the launch events which will run from July 29th to August 2nd, 2017 insha'Allah. Born and raised in London, children’s author Shoohada was surrounded by love early on, part of a large family and a friend to many. She left her formal education on hold when she was 16, taking a job in retail, and three years later, she had moved up into the management team. When she was 21, Shoohada gave birth to her first child, and two years after that, she decided to focus on motherhood and family life full-time. She had always enjoyed reading however, and so she began to use some of her free time to write her own stories. Today a mother of six, Shoohada lives a busy life, splitting her days between her writing and her motherly responsibilities. She shares her home in the East End of London with her family, and anytime she has a moment to herself, she reads and writes. Someone who is immensely aware of the world around her, Shoohada maintains an active presence in the community, taking part both in fundraising and charity events. In 2013, Shoohada published her first picture book to great acclaim. Her mission is to inspire love and hope among people through her stories, both those that deal with her Muslim faith and those that do not. She plans on continuing to publish her stories for the foreseeable future. All of Shoohada Khanom's books are available on Amazon.com, Amazon.uk, Createspace, and Fofky's Online Book Cafe. Misbah Akhtar tackles a difficult issue with her first children's book; divorce. This societal issue can be very challenging for single mothers and their childrens especially during Ramadhan. Here is a book you should add to your list of Ramadhan Children's books to foster a genuine dialogue with affected people in the ummah. We hope to get it out this Ramadhan insha'Allah. In this compelling debut children’s book, Misbah Akhtar tackles a difficult issue; divorce. This societal issue can be very challenging for single mothers and their children especially during Ramadhan. Misbah Akhtar is a blogger, author, activist and mother of 4. She was born and bred in London and her passions include: photography, eating Wispa bars and finding inventive ways to tease her kids. She has a background in Psychology and English Literature, and is currently working towards becoming a life coach. She is the founder of Single Muslim Mums and Editor-in-chief of Mumspiration: her own personal transformational journey. Check out her blogs at singlemuslimmums.wordpress.com and/or mumspiration.co.uk. 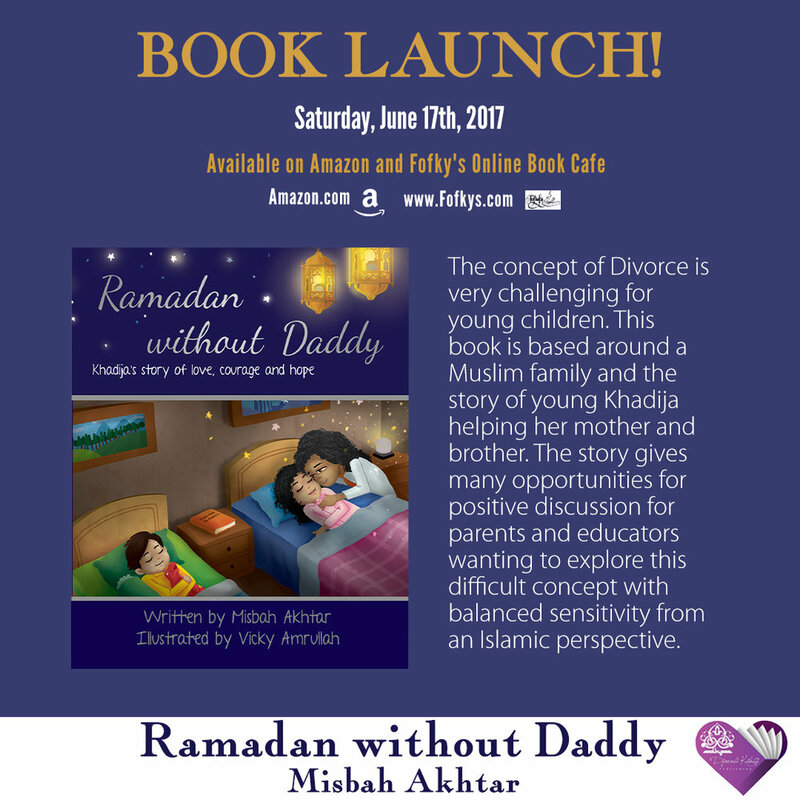 Amazon : https://www.amazon.com/Ramadan-without-Daddy-Khadijas-Courage-ebook/dp/B071JW9WCS for eBook . Free eBook promotion starts on 06/10/2017 and ends on 06/12/2017. It is a 30-page paperback children’s book intended for children, parents, and educators who want to address divorce with tact. LAUNCHING SATURDAY JUNE 17TH, 2017! A children's book that portrays a positive and real life story of a Muslim Family. Surprise! by Zaheera Jina is coming soon. Heads up! Children's Books, Children's Behavior and Parenting Guides, Homeschooling resources, Zaheera Jina, Surprise! Fitra Journal: The Muslim Homeschool Quarterly: Getting Started is a nice collection of testaments by Muslim Homeschoolers, a few of which are men masha'Allah. I loved this free treat because the contributors provide many resources and some of their opinions mirror my current state of mind. I'll not impose anything on my son. I'll continue to let him roam free and discover things on his own and intervene when he needs me. This was reinforced by the scripture which says that for the first seven years of a child’s life, play with the child. In the next seven years, teach them, and in the last seven years (by 21 years), be a friend. So I plan to do just that because I have a full load of tasks already. To get back to the review, Fitra's first issue is divided in five chapters. Chapter 1 deals with 'Where to Start'. Chapter 2 with 'The Fundamentals', Chapter 3 talks about 'Socializing, Support and Self Care', and Chapter 4 is 'Further Outside The Box'. Finally, Chapter 5 is about 'Resources We Love'. Each section is exactly what it sells. It's on point. Now, preparation is the key and this issue is very helpful and resourceful because I tell you homeschooling information can be draining and overwhelming! While I have to get the man of the house to agree to homeschool when the kiddo reaches 7 years old, the testaments of Karima Heraoua titled 'How I Got My Husband To Homeschool' in particular gives me hope. We have plenty of time to see eye-to-eye on this issue insha'Allah. The kiddo is such a social butterfly and socialization is the main concern. And contributor Jamila Alqarnain addresses this issue and ways to counteract it. Besides, I try my best to make sure the kiddo doesn't become sheltered. Klaudia Khan and Saira Siddiqui's point of views were also very valuable as I felt like they were talking to me in 'Learning to speak their language' and 'Understanding Child's Play' respectively. Now, I need to get my copy of Miraj Audio because I use an eclectic source with morals from traditional story books which is fine but I want religious tones instilled in my child as well as we ride this homeschool journey we started in November 2015. I've always wondered if there was such a thing like Miraj Audio or if it was something I needed to design for the needs of my child. And there is. Alhamdullilah for the help of all these homeschoolers trying to make it easy for us.Jazakh'Allah khair to y'all!